The image featured on the sleeve of the band's album Animals and has been restaged to mark the band's back catalogue being reissued. Record bosses had to commission a new inflatable pig for the photo because the original cover star - which had been kept in a workshop in Halesworth, Suffolk - was found to be leaky. The original cover shoot took place over three days in late 1976 but on the second day the helium-filled pig broke free and drifted over to a field in Kent. The new shoot was staged on a different side of the decommissioned power station due to partial demolition and temporary buildings in the area. 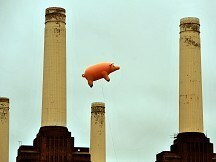 Inflatable specialist Air Artists, which has worked with members of the band for many years, created the new pig. The 30ft-long porker, which was tethered to the ground, was filled with 12 canisters of gas. A spokeswoman for the band said: "Sadly, two weeks prior to the event, the original neoprene glued pig was officially declared not airworthy and a brand new high-frequency welded PVC replica Pink Floyd pig has been made for the occasion." The band's 14 studio albums have been remastered and will be available on CD from today. In addition there will also be lavish new versions of Dark Side Of The Moon, with Wish You Were Here and The Wall being given the deluxe treatment over the coming months.